Five things to notice about this photo: 1) the desperate horror of the kid at the the lower-left; 2) the resigned despair of the grown man at the right with the T-shirt over his shoulder; 3) the woman in Draymond's right armpit, fruitlessly praying for a miss; 4) what appears to be Charles Barkley Photoshopped in at the far left; 5) Steph Curry's closed eyes. I’d like to say I never doubted. But the Warriors had played three of their worst quarters of the season. They appeared to be stunned by the relentless onslaught of the Pelicans, who were energized by a New Orleans crowd watching its first home playoff game in four years. I spent that time folding laundry and scowling as the Dubs took bad shots, turned the ball over, and utterly failed to play the tenacious D they’re known for. At the start of the 3rd quarter it was 89-69 Pelicans, and while a comeback from that was not a physical impossibility, it did not seem likely. 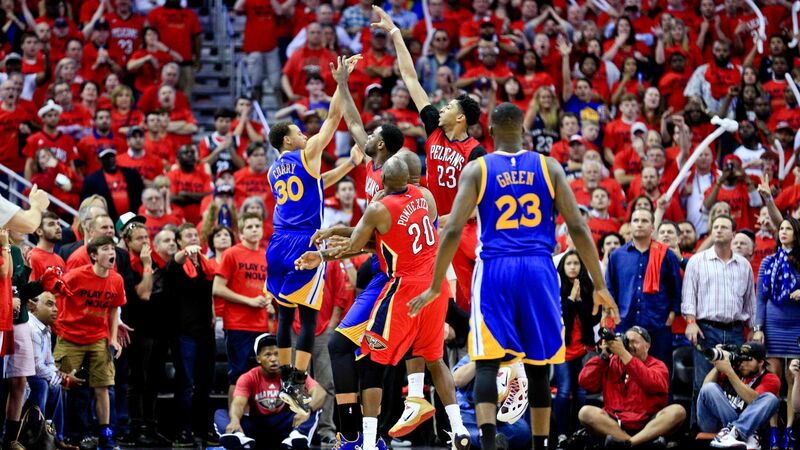 The Warriors didn’t really need this game, anyway; I would have been fine letting New Orleans have its moment, then crushing them in Game 4. The players on the floor had other ideas. After looking lost for three quarters, the Dubs could suddenly do no wrong, making clutch shot after clutch shot, getting offensive rebound after offensive rebound. They got it to 12 with 4:39 left, 10 with 3:56 left, then 8 with 3:34 to go, at which point the Pelicans took a timeout. And that right there was the crucial moment. Even after Davis made the second, it was still a three-point game, 108-105. And then this happened. And the game should have ended right there, with Steph Curry going to the free-throw line to complete the 4-point play; but somehow no foul was called and we were forced to endure five minutes of overtime. There was no way the Pelicans were going to recover from the body blow they’d just received, and though there were some touch-and-go moments in the extra period, the result was inevitable. There was loud rejoicing all over Northern California while the children of New Orleans cried themselves to sleep. * A terrible name, both for an arena and a miracle. Maybe someone will come up with a better one at some point. This entry was posted	on Friday, April 24th, 2015 at 11:37 am	and is filed under Golden (State) Years. You can follow any responses to this entry through the RSS 2.0 feed. You can leave a response, or trackback from your own site.